It seems landlines are becoming obsolete. According to some studies, landlines may disappear altogether by 2037. As more and more people choose to pay only for a cellphone, the traditional landline is predicted to suffer a natural death, and will soon go the way of the telegram and snail mail. I receive this news with a great deal of dismay. If you are part of Generation Z or born in the 21st century, you may wonder what all this brouhaha is about, and why one should lament an antiquated mode of communication. You may well argue that a landline is nothing more than a communication dinosaur. Who needs landlines when your smart phone fulfils a multitude of functions, one of them being communication? Well, all I can say is, you just don’t know what you’re missing! It is sad to think that in the future, no home will respond to the sound of a ringing phone. A landline may well have been around since the time of Alexander Graham Bell, the inventor of the telephone. But for those of us who predate the mobile phone era, there’s nothing more heart-warming than the ring of a home phone. When we were children, there was usually a scramble to see who’d be the first to get the phone, and the thrill of relaying to the rest of the family the identity of the caller. Of course, this was before children grew up and became blase and waited for someone else to answer the phone. Then there were those childish pranks we’d play on a neighbour before the advent of Caller IDs; these landlines provided endless hours of amusement during long boring summer holidays. And then, of course, there were those ‘wrong numbers’, usually received at some unearthly hour, waking up the entire family! 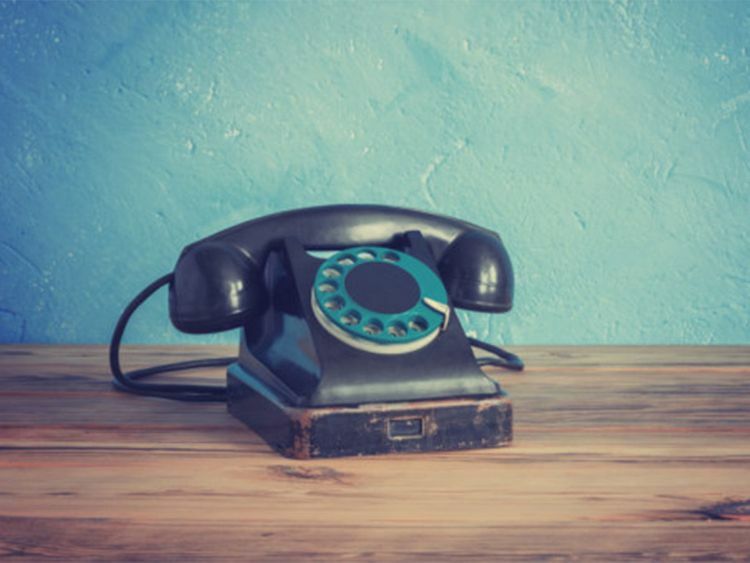 Landlines in the past were usually big, clunky objects that took pride of place in your home. These phones of the past had a huge circular dial, and you had to stick your finger into the right slot and manually turn the dial. It made a wonderful whirring sound, especially if you had to dial 9 or a zero, which were the last numbers on the dial and took the longest to turn. At the end of each turn, you’d release the dial and it would automatically return to its original position with a comforting ting at the end. This provided for us a total sensory experience — the sound of the whirrs and tings, the sight of the huge dial, and especially the tactile sensation of your fingers moving the dial. When push-button phones came along, they somehow failed to produce the same thrill as the rotary dial. Let me tell you, there is nothing more satisfying than banging down the receiver when you are angry with someone, and no modern-day phone can replicate this! I mean, can you ever imagine doing this with your fancy mobile with its delicate electronic innards? Not unless you plan to buy a newer model! Well, we have to change with the times, I guess. But it is an irony that, as we become more connected, we are actually becoming more disconnected. To people of an older generation, a landline, like the TV (read the idiot box), was the heart and hearth of the home, an instrument that brought the family together, a gadget by which parents could still keep an eye on their children and know who they were speaking to. It was also an aid to memory; we knew all the important numbers by heart. Not like today, where the cell phone stores every number and all you have to do is locate the name. A whole vocabulary, an entire lexicon, will disappear with the vanquished landline. For those of us who grew up in the pre-mobile era, it may soon become yet another item of nostalgia. Padmini B. Sankar is a Dubai-based freelance writer.